The terminal stages of programmed cell death (apoptosis) can be identified by the condensation of chromatin and fragmentation of the genomic DNA, alongside blebbing of the membrane. As apoptosis occurs, chromatin within the cell undergoes significant structural changes from a heterogeneous network, which is genetically functioning, into a highly condensed, amorphous form. Condensed chromatin appears brighter than functioning chromatin when stained with nucleotide binding dyes, meaning apoptotic cells can be identified either qualitatively, using fluorescence microscopy, or quantitatively, using flow cytometry. Nuclear Condensation Assay Kit (ab139479): Flow cytometry analysis of untreated staurosporine-treated Jurkat cells. 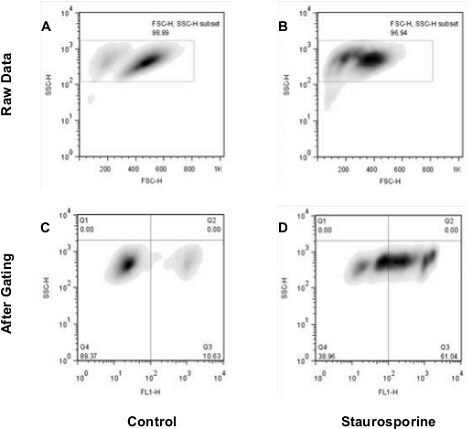 The raw data shown in panels A and B was used for gating cell populations (rectangles) for analysis. Panels C and D represent the separation of healthy and apoptotic nuclei based on their characteristic fluorescence. A nuclease, Caspase-Activated DNase (CAD), is used by cells to fragment and break down the condensed chromatine. CAD is activated by the caspase cascade, which results in DNA cleavage at the sites between nucleosomes, known as internucleosomal linker sites, resulting in the generation of DNA ladders - fragments of around 200 base pairs in size. An established method of DNA ladder detection is the analysis of the fragmented DNA on agarose gel using an electrophoretic method. This method provides reliable semi-quantitative data and is simple to run. Another method for the detection of DNA fragmentation involves identifying strand breaks/nicks with a TUNEL assay. DNA fragmentation also results in the number of cells stalled at the G1 stage of the cell cycle, and this can be detected using flow cytometry. The cell membranes can be permeabilized (e.g. using 70% ethanol), resulting in the leakage of the DNA fragments and cells with a lower DNA content. Following staining using a dye such as PI the G1, S and GM2 cell cycle stages can be profiled using flow cytometry. The apoptotic cells are clearly found as the high subG1 population located to the left-hand side of the G1 peak. However, this parameter alone is not a perfect indicator for apoptosis as the subG1 fraction contains all dead cells, irrespective of their cell type. 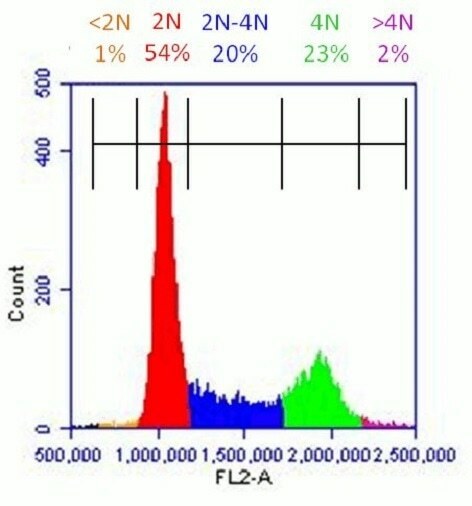 Healthy population of HeLa cells analyzed with Propidium Iodide Flow Cytometry Kit (ab139418): Flow cytometer software was used to establish markers on a histogram plot to quantify the percentage of cells with <2N (dead cells), 2N (G1 phase), 2N-4N (S-phase), 4N (G2 phase) and >4N (M phase) content. Alongside the fragmentation of DNA apoptosis’ final stages involve the blebbing of the dynamic membrane and contraction of cells. During this stage the cytoskeleton of the cell begins to disintegrate, which results in some of the membrane protruding outwards. These protrusions then separate from the cell, removing some of the cell’s cytoplasm with them, to form apoptotic bodies. The blebbing of the membrane can be seen in live cells with phase-contrast microscopy. If using live cells is not possible, or if cells have been prepared for other research (e.g. chromatin condensations or the quantification of fragmentation) it is possible instead to detect the caspase substrates which are associated with membrane blebbing.